Measurements: 3.5 x 5.5 inches, or 88 x 140 mm. Large. Back of card: Deep blue field of stars with red nebula-like swirls. And lots & lots of baseballs, 12 in all. Not exactly symmetric, but easily inverted. Book included: Yes, 324 pages, 5 x 7 inches, or 12.6 x 17.7 cm. Illustrated. Publisher: Workman Publishing. Printed in Hong Kong. Comments: On the back of the box of this deck it says, "On the spiritual basepath", and continues with, "Baseball Tarot offers guidance for every at-bat in life." On the back of the book are these comforting words, "Lessons of the game, lessons of life." This is preachy & dull. This deck sounds a lot like the marriage of baseball & religion. People go to church to relieve those nagging doubts about Life, the Universe & the number 42 (oops, sorry!). People play baseball for fun. People read tarot cards for all manner of reasons. I think a specialty tarot should reflect the nature of the specialization. If there's going to be a subtext (the "spiritual basepath") it should be for us to discover it, to our delight, not to be beat over the head with it. 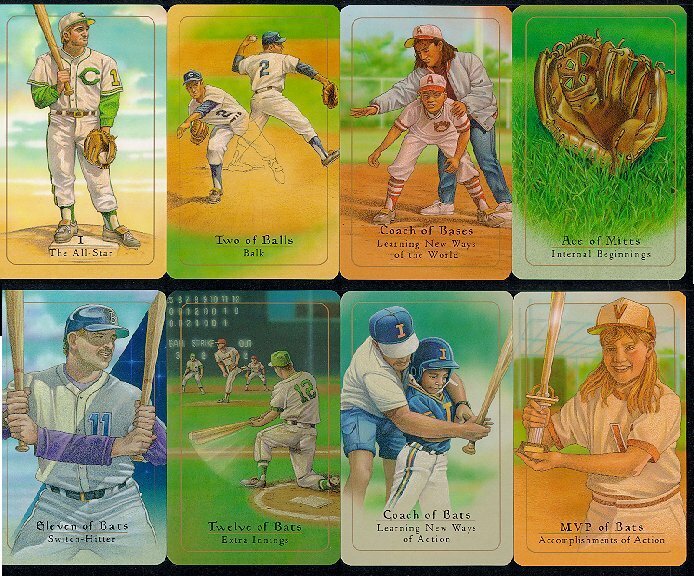 In its favor there are a number of baseball inspired card layouts: "Pitch & Swing", "Change-up", "Hype & Scoop", and "Infield & Outfield, all 2 card layouts. Three-card layouts include, "Hit, Ball & Strike", "Starter, Reliever & Closer", and "Who's on First". There's also a variable-card layout called, "Calling the Plays". In this layout you can ask questions about the relationships between any number of people. Three people, each with one card, arranged in a triangle. Now put a "play" card between each one to see the relationship between them. For four people, start with four cards in a square, then add play cards to show the relationship. For five people, start with a pentagram, etc. There is a Diamond layout, with a card for each of the positions on the field, including the batter, the umpire & the on-deck batter, for a total of 12 cards. And there are layouts for two people, including a dual Pitch & Swing, and "Bottom of the Inning", another 3 card layout. There are instructions for creating other original layouts. On the now out-of-print Tarot of Baseball page I quoted the text for The Devil (aka the base stealer). In this deck, the devil is known as The Goat. Let's look at these two cards closely: The Tarot of Baseball employs baseball metaphors (base stealer for devil) that further enhance the tarot/baseball relationship. In the above deck, The Baseball Tarot, meaningless names are substituted for the traditional tarot names. There's no reason to rename the devil as the goat since neither term relates to baseball. The keywords given for the goat? "Doubt, Pessimism, Stagnation, the Shadow, Manipulation, Sense of having no options, 'Bad attitude'", none of which sound devilish. The full text for the goat is too long to quote here, it wallows in self-pity. Here is a brief excerpt: "But sometimes the shadow side of being the Goat takes over the player's personality resulting in a consistent bad attitude. There is constant grumbling over called strikes at the plate; thoughts that the umpire doesn't like you or that the opposing pitcher is deliberately trying to hit you," etc. Court cards are also uninspired. You can see them above, for the suit of bats: The Eleven, the Twelve, the Coach & the MVP. The suppression of the Page & Knight isn't an innovation, it's merely lame. If we view the four suits as four individual teams, then we can find plenty of "executive positions" to use for court cards. The out-of-print Tarot of Baseball had Manager, Coach, Pitcher & Umpire. There is no reason this deck should copy the other but if there is nothing unique to say about baseball, why have a tarot deck? These designations match the other baseball tarot, except for Pentacles, which are given as Caps. Bases are a better designation. I also like the use of women & children in this deck, but these women & children remain women & children. They never become "team players" in the larger sense. This deck wants to pull us as individuals into the outer world, beyond baseball. Look at the MVP (Most Valuable Player) of Bats, above. Has she accomplished something as a player, a team member, or does her accomplishment relate not to baseball, but to her larger life? You want an answer? Look at the Eleven, the Twelve & the Coach of the same suit. Different uniforms. Different sexes. Different ages. Different levels of expertise. The MVP (eg, King) is the head of her suit, but has no obvious link to it, save baseball itself. So her accomplishment (whatever it may be) is hers alone. It is not a product of her interactions with the rest of her suit (eg, "team"). In conclusion, some of the mechanics of this deck are quite good (the layouts, the suit names), while much of the rest seems uninspired. Mark Lerner is also the editor of the excellent bi-monthly astrology magazine, Welcome to Planet Earth. A footnote: Jessica at US Games lamented the loss of The Tarot of Baseball, by Kasher & Ransom, which US Games published. She said there was simply not enough in common between tarot fans & baseball fans. A pity.